East Big Creek is an unofficial trail in the Grand Mesa National Forest near Grand Junction, Colorado. The trail begins off of Forest Road #114 where it travels up the East Big Creek drainage in the direction of Leon Peak (11,226 feet). 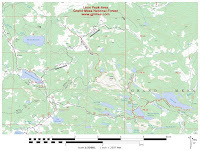 The trail can be combined with a nearby snowmobile route to create a loop or to explore the forest in other directions other than along the creek itself. 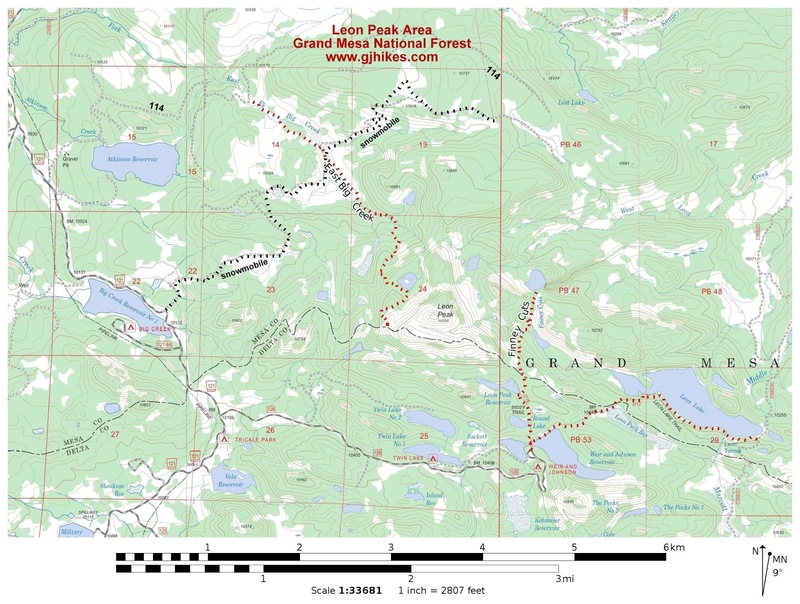 To get there from the Grand Mesa Visitor Center on Highway 65 drive east on Baron Lake Drive for 2.4 miles and turn left onto the Trickle Park Road FR #121. Continue for another 8.5 miles and turn right onto FR #114. Follow FR #114 for about 2.3 miles. At that point it makes a sharp turn as it crosses East Big Creek which runs under the road through a culvert. The road continues its horseshoe bend as it climbs back out of the drainage and it is at that point where you can park in the meadow off to the right. From the road there is a faint trail that can be seen leading toward the creek. There are 2 routes that can be followed at this point. One is through the lush grass along the bank of the creek and the other is up a little higher away. Hiking along the creek there are several beaver dams that have created small ponds of water. Beaver dams are actually of strategic importance to the environment as they slow down the runoff of the stream and allow water to seep into the ground where it recharges the aquifers and even seeps back out of the mountain in the form of springs at lower elevations. Now that water managers better understand the critical nature of the dams beavers are being reintroduced back into many areas. Above the beaver dams there are a surprising number of trout in the stream that can be seen darting around in the shallow water. The fish are large enough that they would be especially fun to catch using ultralite gear where you use a small flexible pole with only 1 or 2 pound line. Just under the 1 mile point the trail reaches an open park where it crosses a snowmobile route that is marked by orange sticks. Near the treeline on the left is an old telephone pole that was probably used back in the day for the line that ran to the Fire Lookout Station on the summit of Leon Peak. From this point you can continue hiking up the drainage toward Leon Peak where the route becomes much more confined and eventually ends in the vast fields of basalt boulders that make up the mountain. There is also the option to hike either down the snowmobile route toward Atkinson Reservoir or around the small hill on the right where you can loop back toward East Big Creek and to your vehicle for a loop that should come out to about 2.5 miles of very easy hiking. We continued another mile and a half or so until we reached a sea of basalt at the 10,890 foot level. That stuff is all kinds of dangerous to hike across besides being extremely slow and tedious. From that point the frame of the old abandoned fire lookout station can be seen on the summit. The story goes that they only used it for a year in which time they discovered that it was much too attractive to lightning. We saw several large bucks in the area. Both were too far away for our camera to get a good picture but it was still nice watching them. On the day that we hiked East Big Creek we were actually driving up FR #114 to where it ends near Lost Lake. As we came around the corner and looked up the creek we were struck by how beautiful it was and had to stop. As soon as we saw there was a trail we grabbed our gear and started hiking. We don't always post most of the unofficial trails that we hike but this one was so enjoyable that we decided to share it. If you would like to see it for yourself then all you have to do is 'Take a hike'.